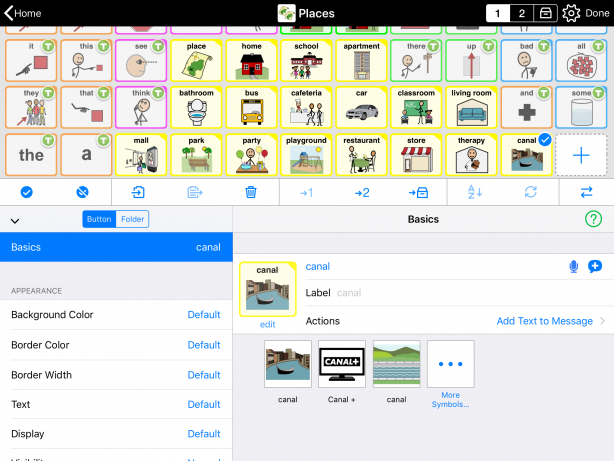 The Crescendo™ vocabulary included in Proloquo2Go has thousands of words pre-programmed. However, you’ll still need to add buttons to talk about specific important people, places, and things. If you want to add a regular button that speaks text and sends it to the message window, you’ll need to make a message button. 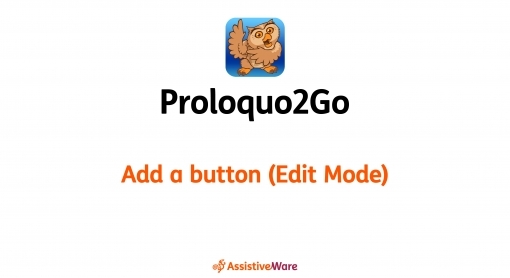 These are the main buttons used to communicate in Proloquo2Go. You can add a message button to any folder in Edit Mode. If you instead want to make a new folder and fill it with buttons, see Make a new folder. Go into the folder where you want to add your button. Then, tap Edit in the bottom toolbar. You can add a button in any empty grid space. You may need to scroll down to find one. Depending on your grid size, there are two ways this may look. If the space is divided, choose the section on the left. On small buttons the choice to create a message button or a folder comes after the tap. On larger buttons create a message button by tapping the left hand side, and a folder button on the right hand side. If prompted, choose Add Button in the popup. In Text to Speak, type what you want the button to say and insert in the Message Window. Alternatively, record audio using the microphone button. Proloquo2Go will try to guess a symbol from your button’s text. Proloquo2Go will also suggest alternative symbols. If you like one of these better, just tap it. Choose a Picture: Select a picture stored on your device’s camera roll or your Dropbox account. For more information about choosing an image and troubleshooting tips, see Add a photo to a button. When you are done editing, tap Done in the top right corner of the screen. This will close Edit Mode and save your changes.